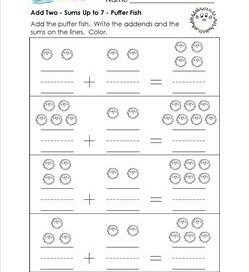 These add 2 worksheets use pictures and numbers to teach the concept of adding 2. 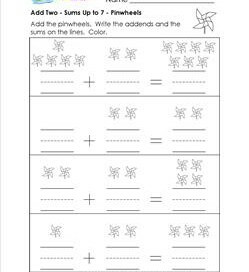 The worksheets start with picture worksheets using sums of up to 5 and progressing up to sums of 10. Primary writing lines are used to help kids write their numbers neatly. 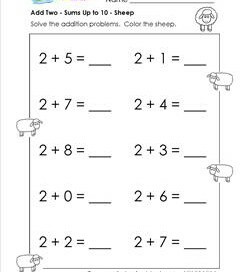 The worksheets with numbers have 10 problems per page using 2 as the first or second addend. 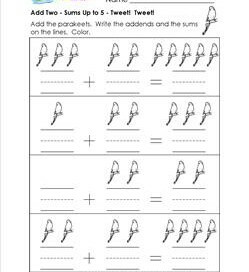 Being familiar with the concept of adding on and/or counting with fingers might be helpful with these worksheets. Add 2 – Tweet! Tweet! Sums to 5. Parakeets have flown in to perch on this add 2 worksheet. They are better in pairs – they get lonely. Add 2 by writing the addends and sums. Sums to 5. 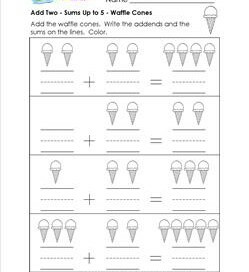 Color in your favorite flavors for these yummy looking waffle cones on this add 2 worksheet. Count the cones. Write the addends and the sums on the lines. Sums to 7. Add 2 on this pinwheel-filled worksheet. Count the pinwheels and write the addends. Add them up and write the total on the lines. Check your answer – count the sums. Sums to 7. These little guys are floating by to help with addition! Add 2 in this underwater themed worksheet. Write the numbers neatly and carefully on the lines. Add 2 – Cluck! Cluck! Sums to 10. These fine feathered friends have come to help with this add 2 worksheet. Don’t lay an egg! 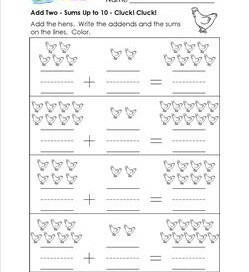 Count up the hens, write the addends then the sums neatly as can be. Sums to 10. Soccer fans rejoice! 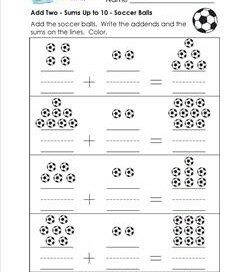 Soccer balls in great numbers have rolled in to help with this add 2 worksheet. Shoot for the goal by adding the balls and writing the sums. Sums to 10. Add 2 with these five-armed starfish. On this worksheet the 2 is the second addend making it easier to add on. 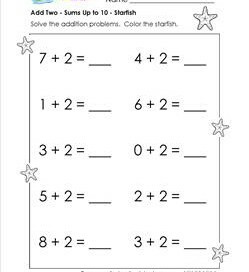 Write the sums on the lines and give yourself a star!